It's wonderful to work with all the great 3D building models in Google Earth, but sometimes there are no 3D buildings for an area or we're working with future buildings that are currently pre-leasing or under construction. To solve this problem we created Cube Forms. Built from the same patent-pending, data processing techniques we use to visualize information on photorealistic models, Cube Forms are fully interactive building models, generated entirely from the Cube Cities spatial database. Complete with floors, setbacks, structural columns and a transparent glass effect, these colourful structures are perfect as immersive infographics on the window, floor or building level. It's the fastest and most effective way to orient floor plans and communicate marketing activity for new buildings. 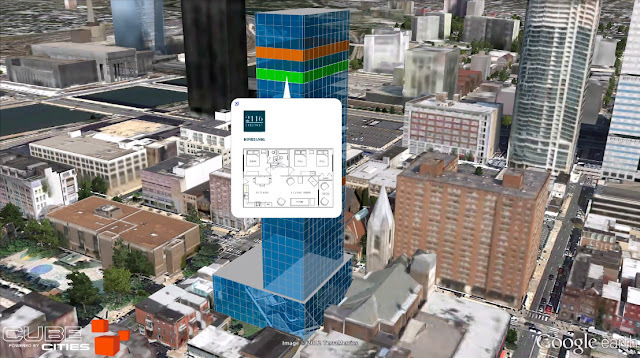 View the video below to see a demonstration of a Cube Forms building in Philadelphia. Excellent use of SU Models and GE. A Unique and valuable resource that many professionals and their industries can and should be able to benefit from. WTG re: Thinking Outside the Box.